How is it already mid-October? Honestly, I want this year to end SO BAD but I am starting to feel all sorts of overwhelmed. I guess it's that weird time of the year because when you look back, there is a lot left to do but the time is quickly running out. And let's not even get into goals, challenges, and successes for the year. I am not ready yet, which is why I have One Pot Chicken Noodle Soup to distract us. It clearly does not feel like Fall in Texas (it probably won't until mid-December) but I am geared up for all things comfort food..and I realized that I have not shared this gem on the blog. This One Pot Chicken Noodle Soup has been my go-to for a while now because it's simple, easy, and hearty to warm your soul. Daal was (and still is) my idea of no. 1 comfort food but I totally get why chicken noodle tops the list in the Western world. The internet probably doesn't need another chicken noodle soup but if you have never made homemade chicken noodle soup from scratch, this is a wonderful recipe that needs to be added to your rotation. I am not kidding when I say we are making One Pot Chicken Noodle Soup from scratch...it involves a whole chicken, broth, and carrot, celery and seasonings. I hope you will give One Pot Chicken Noodle Soup try this Fall and if you do, I'd love to share it on instagram @foodpleasurehealth. In a large stock pot, combine broth, water, chicken, parsley, celery, onion, garlic. Let it simmer for 40-45 minutes until the chicken is cooked. Turn off the heat. Remove the chicken and bay leaves from pot and let it cool down for few minutes. 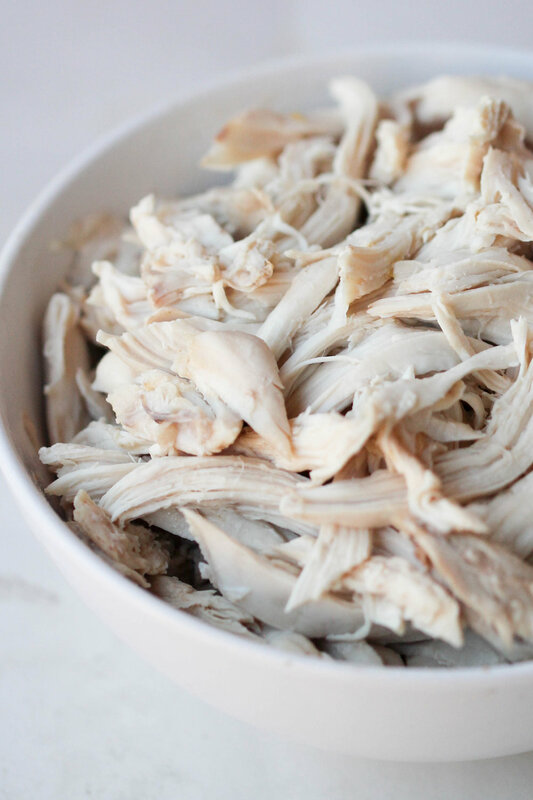 Discard the skin, bones, and shred chicken into small pieces. Return the stock pot to simmer, add about 3 cups of chicken to the pot and pasta. Season with salt and pepper. Simmer for 8-10 minutes until the pasta is cooked. Garnish the soup with chopped parsley right before serving. Are you ready for this year to be over? What's your idea of a comfort food?